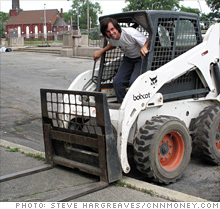 The auto industry won't likely save the city, so people in Detroit need to do it on their own. Phillip Cooley not only runs a $4 million-a-year barbeque business, he's restoring the historic train station. Phillip Cooley at work on Michigan Central Station, below. Detroit's Central Michigan Train Station. Cooley's barbeque restaurant, and the other buildings he's fixed up in Detroit's Corktown neighborhood. 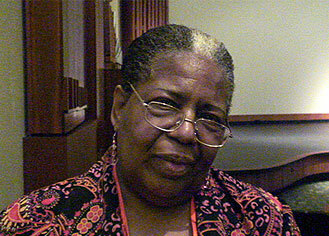 Detroit faces huge challenges but locals here say that they'll soldier on. From community gardens to tech start-ups, here's some of what's keeping the city going. 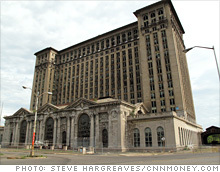 DETROIT�(CNNMoney.com) -- Detroit's decrepit Central Michigan Train Station is one of the starkest symbols of urban blight in the country. Outside I'm set to meet Phillip Cooley, a former Luis Vuitton model who now runs a successful downtown restaurant. Cooley appears, barreling past me in a diesel-powered piece of construction equipment. He's off to spruce up this abandoned space. It's Wednesday morning, and this is what Cooley is doing in his spare time. "A lot of people look at it as a symbol of their defeated past," Cooley, 31, said of the train station, which is such a marvel of decay a pack of Brooklyn-based artists would soon show up to photograph it. "But I look at it as hope for the future. What I'm trying to do in Detroit is build a stronger, healthier community." Detroit needs it. Plagued by unemployment, one of the highest murder rates in the nation and a population that continues to fall, Cooley is just the kind of guy the city is hoping to attract. He doesn't own the train station, but he's planted some gardens in the front and has even grander designs to build a city park. But fixing up the train station is just a side project. His real job is proprietor of Slows Bar-B-Q. 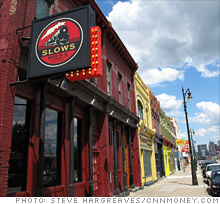 Situated across from the train station in the heart of the city's Corktown district, an up-and-coming artsy neighborhood, Slows is regarded by locals as one of the best places to eat in town. Cooley moved here seven years ago, fed up with modeling and looking for "a career with substance." With help from his father and his brother, a former Chicago-based investment banker, he got a loan and bought three buildings for just under $200,000. He taught himself carpentry and put another $900,000 or so into fixing up the buildings, mainly the restaurant. Now Cooley and his partners, who include his family and a chef, run an inner-city restaurant that was packed with professionals on a Tuesday night. The place employs 55 people, most all from the immediate area. Cooley and his partners were hoping to pay off the restaurant loan in four years. Instead they paid it off in two. Last year, sales totaled $4 million. Moreover, Cooley hasn't just brought a successful business to town, he's brought his family. His parents now live in Detroit, as does his investment banker brother, who now does development work from an office next to the restaurant. Cooley lives in Corktown in one of the buildings he bought. A wood shop occupies part of one of the buildings, which he lets people in the community use for free. He also invites visiting artists, entrepreneurs, or other that come to town to stay with him. He even offered me a place to crash. "I haven't been able to find the community in other cities, or the cheap rent in other cities," said Cooley, explaining why he moved here. Detroit's cheap living is part of the draw for lots of young people, be they entrepreneurs, artists or anyone else trying to make a go of it on their own. It affords them the time to practice their craft or, in Cooley's case, the ability to actually buy a building and start something up. "You can experiment, you can explore, and you can afford to make mistakes here," he said.